"International Business Conference 2017: Creativity, Innovation and Entrepreneurship" provides an international platform for the exchange of leading-edge ideas and research findings on the key driving forces of business: creativity, innovation and entrepreneurship. Conference seeks to represent different emerging approaches related to the concepts of creativity, innovation and entrepreneurship in different business sectors and fields as the key driving forces for the business of today and tomorrow. 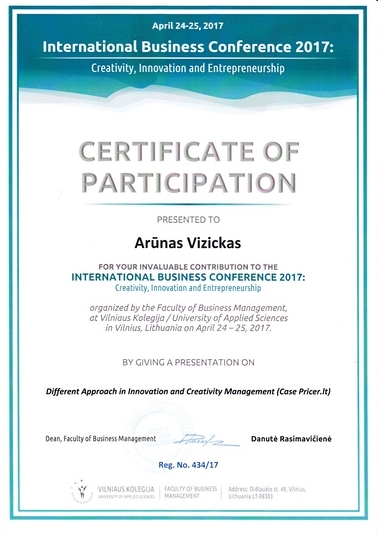 The Conference is an annual event organized and hosted by the Faculty of Business Management at Vilniaus Kolegija / University of Applied Sciences in Vilnius, Lithuania. Over 40 Conference presenters from all over the world came together to Vilnius to present the most leading-edge insights and scholarly discussions related to innovative and creativity-driven business solutions. The Conference proved to be an important international networking event, and created an international platform for the exchange of ideas and research findings on contemporary issues and trends facing the rapidly changing global business environments.